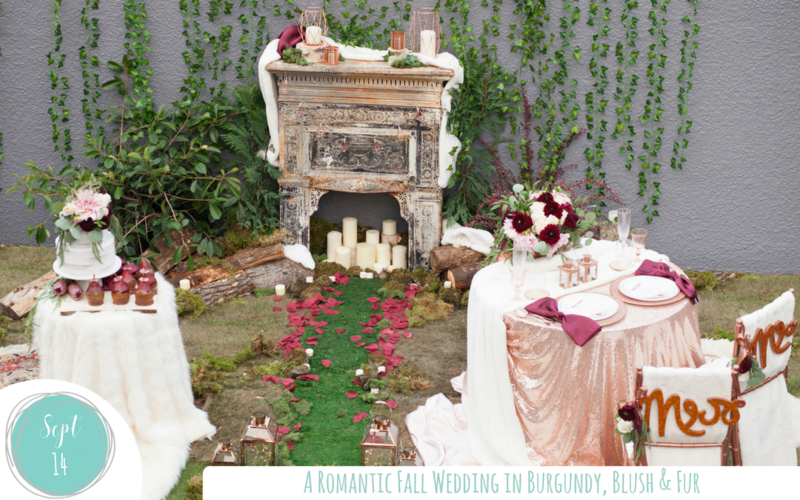 If you are having a fall or winter wedding you’ll love the combination of burgundy & blush. It is such a rich yet soft combination that is elegant and unique when accented with a warm copper rose gold & throws of ivory fur. This beautiful vintage fireplace makes a beautiful altar. Setting up a fireside sweetheart table makes the most of this romantic setting. The tablescape has all of the personalized details you will need to create an unforgettable wedding ceremony. You’ll also be able to maximise this stunning backdrop for your cake cutting pictures and to display some delectable fall treats! So why not shop this look HERE and have some fun creating DIY chair backs or personalized place settings. Then relax and enjoy the crisp fall air as the lights go down and the flickering candles work their magic.